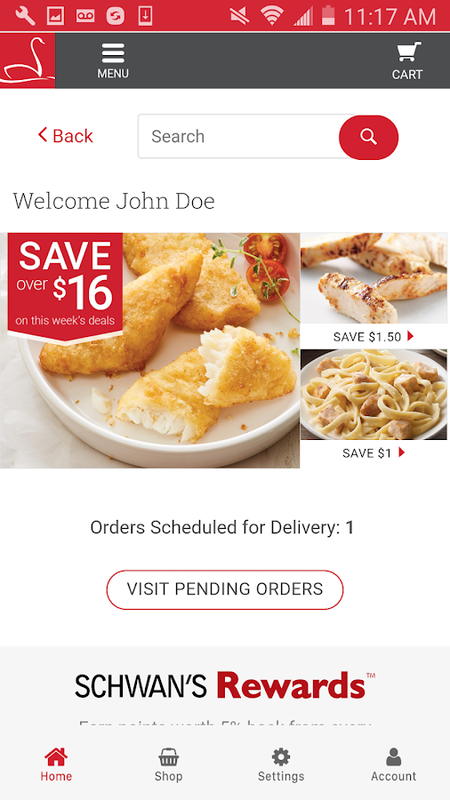 The Schwan’s Food Delivery app makes it easier than ever to getyour favorite frozen food groceries delivered right to your door.Now you can shop, manage your delivery and manage orders all with afew taps on your Android device. Features: • Shop over 350delicious foods whenever, wherever. • Update your grocery orderthroughout the week. • Convenient delivery reminder notices • Orderquickly by using your favorites list. • Save with online-only hotdeals & coupons. • Earn and redeem SCHWAN’S Rewards™ points. •Enjoy the same friendly delivery service to your door. New toSchwan’s Home Service? We offer over 350 high-quality productsflash-frozen at the peak of freshness and flavor, convenientlydelivered to your door. We invite you to open your door todelicious and discover new ways for your family and friends toshare great meals together. The Schwan's App is designed for use onyour Android smart phones and tablets. Our app best supportsAndroid Operating Systems 5.0 (aka "Lollipop") or newer. For olderOperating Systems, the app will redirect to our website, where thesame features can be accessed. Delivery of your favorite food online and wherever you are.PedidosYa allows you to order food from thousands of restaurantsand millions of dishes to your location. Are you craving a hugepizza? A delicious sushi? A juicy burger? Some great empanadas? Adelicious vegetarian food? Only with 3 steps you can receive atyour door your favorite food: 1. Open the app from your Android tofind the restaurants that deliver to your location. 2. Choose yourfavorite restaurant or filter by the food you want to eat, andcheck the menus available for you. 3. Your order is confirmedinstantly and your food will be prepared and delivered to youraddress. What restaurants will you find? Some of the most importantare: - Argentina: McDonald's, Subway, El Club de la Milanesa, SushiPop and more! - Bolivia: Burger King, Fridolin, Pollos Kiky, PollosChuy and more! - Chile: Telepizza, KFC, Sushi House, Juan Maestroand more! - Paraguay: Alberdín, Don Vito, Carnívoros, Pizzotón andmore! - Uruguay: Subway, La Pasiva, Chivipizza, Bocatti and more!Our community loves the food as much as we do (and we are not proneto hyperbole when we say we love it), that’s why every order can berated by you! This allow us to rank all our restaurants with ascore that highlights the quality of the food, the delivery speed,and the service as the presentation of your order, so your decisionis validated by the opinion of thousands of people. Enjoy yourmeal! Otlob believes that ordering food should be fun and easy. That iswhy we built an app that empowers you to order from all yourfavorite restaurants without long call center calls, annoyingupselling, and constant order mistakes. We believe you should beable to order food simply. Join the community of more than1,000,000 people in Egypt that use Otlob to order from thousands oftop restaurants and discover an easier ordering experience. TopFeatures: Use GPS to find top restaurants near you Browse thousandsof up to date menus Sort restaurants by cuisine, price, discounts,and user reviews Automated order transmission technology to reducehuman error Selection of top restaurants in Cairo, Alexandria, theDelta and Upper Egypt How to use the Otlob App: Select yourlocation and browse top restaurants Add your meal to the basketCheckout, pay cash on delivery or pay online by visa Food isdelivered quickly and simply Additional Features: Save money withexclusive deals, discounts, and vouchers Track your order progresswith our in-app live status updater Customize your order to yourpreference just like in the restaurant Review your order history tore-order your favorite meals Browse from top restaurants likeMcDonald’s, KFC, Papa John’s, Burger King, Cook Door, Pizza Hut andmany more! Reviews and feedback: Have an issue with your order?Please contact us at [email protected] for live customer caresupport. honestbee is an on-demand delivery service. Now buzzing inSingapore, Taipei, Hong Kong, Tokyo, Jakarta, Kuala Lumpur, Bangkokand Manila. We deliver food and groceries fresh and fast from yourfavourite restaurants and stores, pick up, clean and return yourlaundry in two days and deliver tickets for the hottest attractionsin town straight to your phone. We want to make your life easier sothat you have time for the things that matter. Why honestbee?Trained concierge team takes care of your orders Same-day, 1-hourgrocery delivery FREE delivery when you reach minimum spendExclusive offers for first-time and returning customers honestbeeis on Shopback Grocery stores you can shop from on honestbee:SINGAPORE Emporium Shokuhin Wine Connection Fresh Direct and more!TAIPEI & NEW TAIPEI RT-Mart Carrefour Costco Frank Meats andmore! HONG KONG Great Food Hall Fusion Gateway The Fresh Grower andmore! TOKYO Shunpachi National Azabu Nonna & Sidhi and more!KUALA LUMPUR Ben's Independent Grocer La Juiceria Shojikiya JezripeBlue Cow Butcher Wine Connection and more! BANGKOK Villa Market CPFresh Mart Wishbeer Wine Connection and more! MANILA RobinsonsSupermarket G stuff Chicco The Straits Wine Company AWC FreshOptions Meatshop and more! JAKARTA Transmart Carrefour Stevan MeatShop Javara Indigenous The Cook Shop and more! Use Coupon Code LOVEZOMATO to get 20% flat off on your first order(only possible if you pay online please). Why does everyone lovethe zomato order app? – Trusted zomato ratings - choose the rightplace to order from. – Widest choice - 25000+ restaurants (9000restaurants exclusively available on Zomato) – Discounts - directlyfrom the restaurants - starting from 10% off, to upto 50% off. –Live order tracking and express delivery - food always reaches youbefore promised time! – Order now and find out your own cool newreason to love Zomato! If you insist, here's the app description– Widest Choice Get whatever you’re craving, from the comfortof your home or office desk – and order food from hundreds oftop-rated restaurants near you. Filter by ratings, cost, cuisine& more, browse through up-to-date and descriptive menus orsimply search the dish you’re looking for. Trusted RestaurantsRatings Make informed choices – use your trusted Zomato ratings tochoose the best place to order from around you. Never make amistake and order from the wrong place ever again. Great SavingsSave while you’re at it – enjoy exclusive offers and deals on yourfavourite restaurants! Discounts offered directly by restaurantsstarting from 10% to upto 50% off. Recklessly low minimum ordersVery low minimum order value for most restaurants. Rs 99 min ordervalue for most restaurants in India. AED 19 min order for mostrestaurants in UAE. Have fun! Late night delivery If you're ever uppast midnight watching TV, and you want to munch on a juicy burger,you can order from a wide range of late-night delivery restaurants;we’re open 24x7! Multiple payment options Pay cash on delivery, oruse online payment options like debit or credit cards and netbanking. We also accept mobile wallets like Paytm and MobiKwik inIndia. Fastest checkout ever Save your most used addresses to placeorders even faster. See your entire order history, and save yourfavourites to reorder them with a single tap. If it takes you morethan 10 seconds to order your favourite North Indian curry-naanmeal, you're doing it wrong. Live order tracking and support Trackyour order status with real-time notifications; rely on our expressdelivery – your food will always reach you before promised time :-)Maniacal customer support Contact our support team using the in-appchat feature if you need any help with your order. Gone are thedays of turning red while yelling 'where's my food?' into thephone. Now all your favorite fast food restaurants are on ZomatoOrder Your favourite fast-food restaurants – Domino’s Pizza,McDonald's, KFC, Subway, Dunkin' Donuts *pauses for breath* BurgerKing, Box8, Chaayos, FreshMenu, Taco Bell, Pizza Hut...we've gotthem all. Yay! Please note that FUP applies on the LOVEZOMATOcoupon code. The max discount is upto Rs 500 in India, and AED 50in UAE, and LBP 15,000 in Lebanon.